Premium Jane is now selling a citrus-flavored full spectrum CBD oil. This article will give you all you need to know before buying this CBD tincture to soothe your needs. · Pain: Natural pain relief tops the list for many CBD oil products. Cannabinoids may prove useful in pain modulation by blocking neuronal transmission in pain-prone pathways. CBD is also often used to treat chronic pain. · Anxiety: Studies have shown that CBD oils have an anxiolytic effect. Cannabidiol has been seen to reduce anxiety in patients who have anxiety-related issues. These include, amongst others, social anxiety disorder, panic disorder, post-traumatic stress disorder and obsessive compulsive disorder. The natural compounds found in the Citrus CBD tincture are effective for the relaxation of the mind, hence inducing a sense of calmness. · Acne: CBD has been suggested to have properties which reduce inflammation, and thus it can be used to decrease sebum production. A study showed that when sebaceous cells come into contact with CBD, they stop secreting any excess sebum. In short, cannabidiol might be good for your acne problems. · Seizures: Seizures occur because of impromptu and dramatic fluctuations of electrical activities in the brain. Recent studies have shown that patients who receive CBD treatment experience a drop in their seizures. Quality: This product is 100% organic. No preservatives or pesticides are used in its production. The CO2 extraction method helps to maintain its purity. This CBD oil is also tested in a third-party lab to ensure it poses no negative side effects to the user. The Premium Jane Citrus CBD Oil is a full-spectrum formula for those who prefer to avoid the raw, somewhat bitter taste of natural hemp. Effects: The Citrus CBD tincture is known to be very effective in dealing with a number of different medical conditions. It is 100% safe and legal in all 50 states. It comes in a 100 mg CBD tincture, 600 mg CBD tincture, or a 300 mg CBD tincture. Since this Premium Jane CBD oil is sourced from pure, organic and all-natural hemp, it is a recommended nutritional supplement for sleep-related issues, pain, anxiety, inflammation and day-to-day stress. 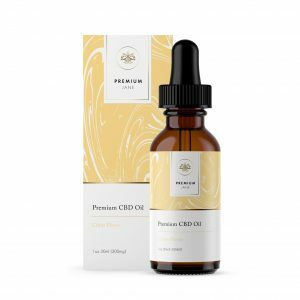 Price: Should you be looking for this CBD tincture for sale, you can visit the official Premium Jane website to buy the CBD oil online. You can also easily find it on some other websites which have coupons and offers. This product retails at $54 for 300 mg of CBD oil. Final thought: The citrus flavor of this product is an added advantage to it. It is both delicious and fast-acting. It is also important to note that it contains no artificial flavoring, as the citrus flavor is extracted from real citrus fruits.